54 S UMMER 2018 PracticeLink.com OMAHA, NE Neurology ENT Dermatology Cardiology Radiology OBGYN – w/Academics Teleneurology Plastic Surgery Urology COUNCIL BLUFFS, IA Pediatrics LINCOLN, NE Family Medicine* ENT Endocrinology OP Internal Medicine GRAND ISLAND, NE Pulmonology / CC** Hospital Medicine** Neurosurgery** Emergency Medicine** Family Medicine General Surgery KEARNEY, NE Gastroenterology** Psychiatry** Emergency Medicine* Hospital Medicine* Orthopedics Pulmonary / CC** Anesthesiology* CHI Health is the largest faith-based healthcare system in Nebraska and southwest Iowa. Our two physician enterprises offer primary and specialty care at more than 150 locations. CHI Health is the primary teaching partner of Creighton University's health sciences schools. We have opportunities in the following communities: Inspired calling. Incredible career. 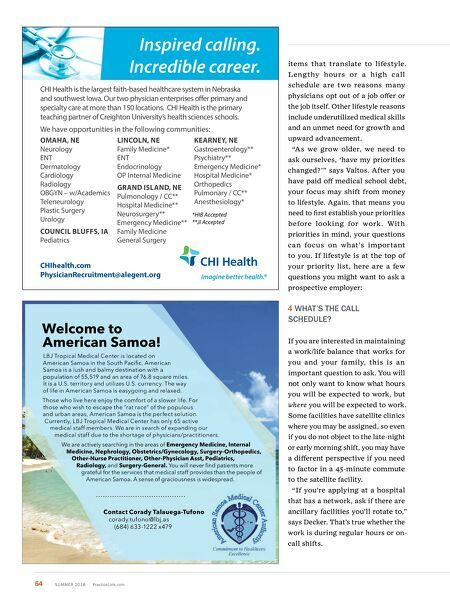 CHIhealth.com PhysicianRecruitment@alegent.org *HIB Accepted **JI Accepted Welcome to American Samoa! LBJ Tropical Medical Center is located on American Samoa in the South Pacific. American Samoa is a lush and balmy destination with a population of 55,519 and an area of 76.8 square miles. It is a U.S. territory and utilizes U.S. currency. The way of life in American Samoa is easygoing and relaxed. Those who live here enjoy the comfort of a slower life. For those who wish to escape the "rat race" of the populous and urban areas, American Samoa is the perfect solution. Currently, LBJ Tropical Medical Center has only 65 active medical staff members. We are in search of expanding our medical staff due to the shortage of physicians/practitioners. We are actively searching in the areas of Emergency Medicine, Internal Medicine, Nephrology, Obstetrics/Gynecology, Surgery-Orthopedics, Other-Nurse Practitioner, Other-Physician Asst, Pediatrics, Radiology, and Surgery-General. You will never find patients more grateful for the services that medical staff provides than the people of American Samoa. A sense of graciousness is widespread. Contact Corady Talauega-Tufono corady.tufono@lbj.as (684) 633-1222 x479 items that translate to lifestyle. Lengthy hou rs or a high call schedule are two reasons many physicians opt out of a job offer or the job itself. Other lifestyle reasons include underutilized medical skills and an unmet need for growth and upward advancement. "As we grow older, we need to ask ourselves, 'have my priorities changed?'" says Valtos. After you have paid off medical school debt, your focus may shift from money to lifestyle. Again, that means you need to first establish your priorities before looking for work. With priorities in mind, your questions can focus on what's important to you. If lifestyle is at the top of your priority list, here are a few questions you might want to ask a prospective employer: 4 w HA t 'S t H e CALL SCH e DUL e ? If you are interested in maintaining a work/life balance that works for you and your family, this is an important question to ask. You will not only want to know what hours you will be expected to work, but where you will be expected to work. Some facilities have satellite clinics where you may be assigned, so even if you do not object to the late-night or early morning shift, you may have a different perspective if you need to factor in a 45-minute commute to the satellite facility. "If you're applying at a hospital that has a network, ask if there are ancillary facilities you'll rotate to," says Decker. That's true whether the work is during regular hours or on- call shifts.